Targeted at people with dry hair, I realised that when I was using it, my hair behaved better after showering (it was easier to comb), it fell into place nicely in the mornings and tangles were a thing of the past. When I strayed and ended up with what could pass for a birds nest, Dove gently steered me back to the path of smooth manageable hair. It did not weigh down my hair nor make it feel oily. Scent is light and not overwhelming. Best of all, its affordable (I believe a 200ml tube retails for below RM10) and easily found. I can’t quite ask for more! I was gifted with a small tub of Dove Hair fall Therapy conditioner last year by the Soloverly gals and it was a perfect size for travel so I kept it purely for travel. Honestly, I can’t quite tell the difference between the Hairfall Therapy and the Dry Therapy – they are both thick yet do not weigh down my hair and both leave my hair feeling light and tangle free. So when I’m doing a repurchase (which is soon) its going to be a toss up between these two! Any thoughts on which you might prefer and why? 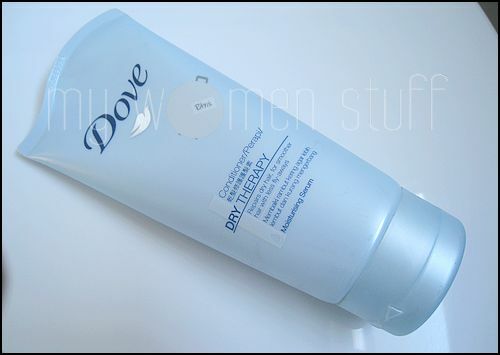 I bought the Dove Dry Hair Therapy conditioner yesterday and decided to give it a try. I have dark, textured, voluminous and extremely dry hair which i wash everyday because the place where i live is humid. I washed my hair around an hour ago and as i let it air dry now, i think the product works fine. It makes my hair feel softer, shinier, light weighted, reduces frizz pretty well, detangles and adds just the right amount of volume all in the first use! Though i have to admit my hair wasn’t damaged, only dryness issues. And this conditioner handles them effectively. I have to say it’s a great product! Coming in late on this. I’ve tried the Hairfall Therapy (bout of panic during the post-partum hair loss, thank god it stopped) and it’s really, really nice. However, as with all other drugstore hair products, I developed an allergy to it after some time. Sigh. I have a scalp that only likes expensive Keratase stuff. I can still use it though… like twice every 6 months and I’ll be all right. Any more frequent and it’s EEK! Dove dry therapy conditioner is really a nice product for me. I have dry hair and the conditioner suits me very well.